I’m happy to let you know that after a successful trial earlier this year the Library now has access to The Listener Historical Archive, 1929-1991 from Gale Cengage. This gives you complete access to the archive of this landmark BBC publication. 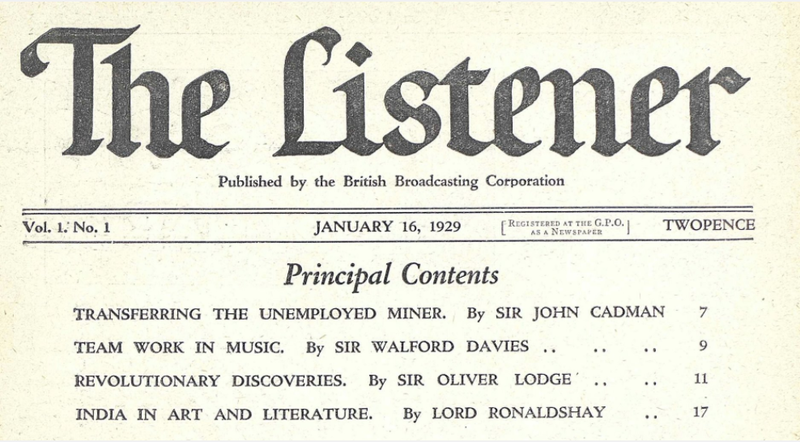 You can access The Listener Historical Archive, 1929-1991 via the Databases A-Z list and Newspapers & Magazines database list. You can also access the title through DiscoverEd. Screenshot from front page of first issue, Wednesday, January 16, 1929. Following a request from a HCA student I’m pleased to let you know the Library has trial access to the The Listener Historical Archive from Gale Cengage. This gives you access to the complete archive of the BBC periodical that was published from 1929-1991. You can access The Listener Historical Archive via the e-resources trials page. Trial access ends 12th March 2018.